Illumina have announced the iDEA Conference (June 14–15, 2011, San Diego), where finalists in the iDEA Challenge will present their approaches to analyzing, visualizing, and interpreting next-generation sequencing data. The iDEA Conference is open to anyone interested in methods for understanding data produced by next-generation sequencing and high-density array studies. The iDEA Challenge winners will be announced at the conference. The image below summarizes the feedback received from VIZBI participants. Many thanks to everyone that submitted feedback, especially those who took time to give specific suggestions for improvement. 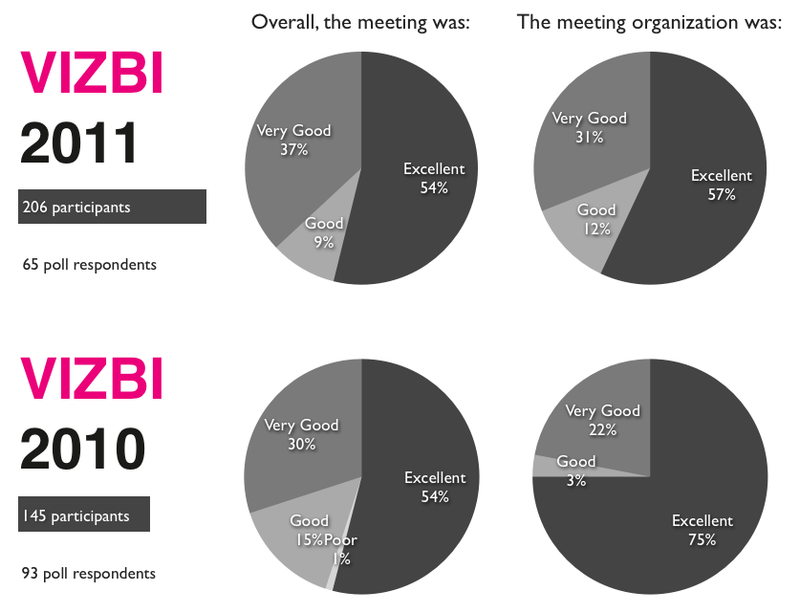 Overall, the feedback is clearly very positive and quite consistent across both VIZBI meetings so far, indicating that the VIZBI format addresses an important and largely unmet need. On behalf of the VIZBI organizers, I would like to thank again the speakers, session chairs, poster presenters, tutors, and all who contributed to making VIZBI 2011 a very exciting and engaging meeting. 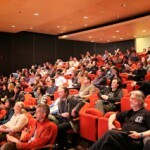 We hope you can join us for VIZBI 2012 (March 6-8) at the EMBL in Heidelberg, Germany, or again in 2013, when VIZBI returns to the Broad in Cambridge, MA, USA. 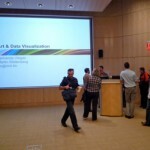 1st IEEE Symposium on Biological Data Vis. We are delighted to announce the call for participation for the 1st IEEE Symposium on Biological Data Visualization (BioVis 2011), 23-24 October 2011 in Providence, RI, USA, which will be co-located with IEEE VisWeek 2011. BioVis is designed to appeal to all interested in biological data visualization, and especially for researchers in computer science, bioinformatics, and biology who are involved in the design, implementation, application, and evaluation of novel visualization techniques and interested in the theoretical foundations underlying these topics. It features a full paper track, in which the best submissions are presented as talks and published as part of the meeting proceedings. BioVis is planned to complement the VIZBI meetings, which lack a paper track, and are instead organized in a format more typical for biology conferences. Whereas VIZBI aims to review current visualization methods, tools, and challenges in biology, BioVis aims to present novel approaches to these challenges. 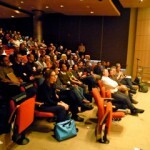 The VIZBI and BioVis organizers plan to actively encourage an ongoing dialog and exchange between the two meetings, e.g., by sharing invited speakers. The deadline for paper submission is 30 April 2011, and for abstracts is 8 July 2011. 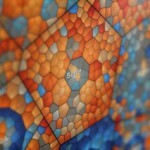 The VIZBI 2011 posters can now be browsed visually via thumbnails at: http://vizbi.org/2011/Posters.